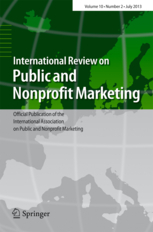 The International Review on Public and Nonprofit Marketing is the official IAPNM publication since 2004. It publishes English-language articles and case reports in the field of public and nonprofit marketing and closely related disciplines. Relevant doctoral thesis reviews and book reviews are also welcome. The main objective of the Review is to foster the study of marketing topics from an interdisciplinary perspective and provide a forum for researchers interested in examining these issues from practical and theoretical viewpoints. Establishing a common vocabulary with which to discuss methods, procedures, results and experiences will improve the exchange of ideas between participants of varied backgrounds. To be accessible to a diverse community of academics and professionals, the Review will only accept articles that display strict scientific rigor and excellent expository clarity. First-rate scientific quality is guaranteed by a large editorial board composed of internationally recognized experts from prestigious academic and research institutions. Papers submitted for publication are evaluated through a double blind refereeing process.